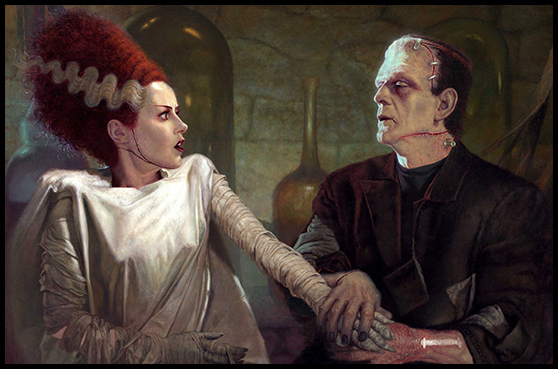 Here you will find classic Horror & fantasy paintings and great monster prints. All art is the work of DANIEL R. HORNE painter, sculptor, doll maker. If you are a fan of Classic Horror and Fantasy look no further we've got it all here for you. If you would like to commission Daniel for a special piece of art, just drop him a line. Some of Daniel's classic portrait busts will take a break from production while new creations are added to the site! Please visit the NEWS section to view updates to the Galleries and Store. CLASSIC CREATURES COLLECTOR'S CLUB ! JOIN THE CLASSIC CREATURES COLLECTOR'S CLUB NOW! Just join the web site and you will be a member of the CCCC ! When you become a member, you will be able to see works in progress and be offered special members only !